MM's Kitchen Bites: Hummus...this or that...no right or wrong!! Hummus...this or that...no right or wrong!! Wash and soak chickpeas overnight in water. Drain and wash. Cook in salted water until soft and mushy. Drain and keep aside. Don’t discard the water the chickpeas were boiled in. While the chickpeas are still warm, spoon them into a blender. Add the rest of the ingredients and blend into a smooth paste. Add a few tablespoons of the water saved earlier from boiling chickpeas and blend again. 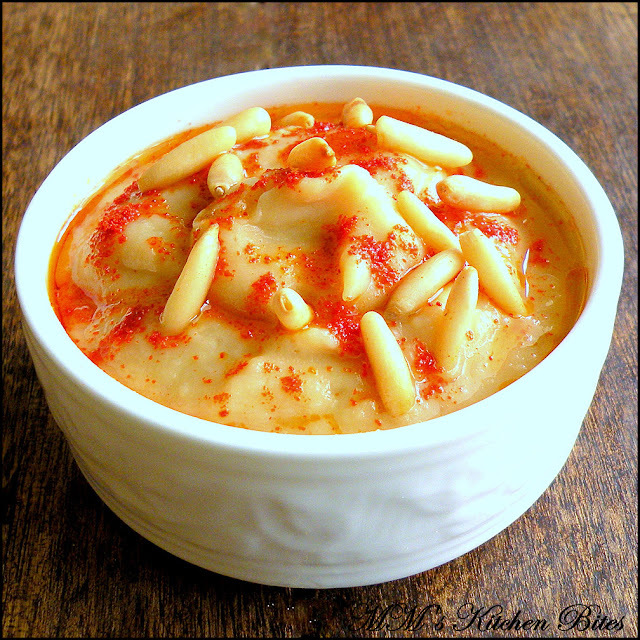 Remember that hummus tends to become thicker as it cools, so add water keeping this in mind. Transfer hummus to a serving bowl and add topping of your choice. No need to panic if you don’t have bottled Tahini and certainly no need to buy specially for making hummus (more so if you make it only occasionally) Just lightly toast 2 tbsp sesame seeds – not to color them but just to warm them up. Blend with about 1 tbsp vegetable oil in the blender to a smooth fine paste before adding rest of the ingredients of the hummus. Pindi Chana...where we came from!!! Saffron rice...kuch peela ho jaye!! Pita Burgers...small on size, not taste! !